O.K. it’s riddle time: I am your ally when situations get heated, I feel like a welcoming warm hug when it gets a little chilly and I am always visible. What am I? No idea you say? I am an Occunomix Men's Hi-Vis Yellow LUX SWT3FR Flame-Resistant Pullover Hooded S ... (see full details) (see specifications) #OCCLUX-SWT3FR. O.K. it’s riddle time: I am your ally when situations get heated, I feel like a welcoming warm hug when it gets a little chilly and I am always visible. What am I? No idea you say? I am an Occunomix Men's Hi-Vis Yellow LUX SWT3FR Flame-Resistant Pullover Hooded Sweatshirt. Not your ordinary FR hoodie, this Occunomix Pullover meets ASTM F1506 safety requirements, and it's rated by the National Fire Protection Agency at NFPA 70E. It meets Hazard Risk Category 2, and has an Arc rating of ATPV = 19.7 cal/cm². All these letters and numbers mean that in dangerous situations this flame-resistant sweatshirt won't melt and burn when it's exposed to heat and flame. The high-visibility yellow color of this Occunomix LUX SWT3FR pullover keeps you visible even in low-visibility conditions. To make absolutely sure you’ll be visible on the jobsite, 2-inch 3M Scotchlite reflective stripes, one 360-degree horizontal stripe, two vertical and two sleeve stripes, light up and reflect even low levels of light. You’ll look like a walking highlighter marker when you have this high-visibility sweatshirt on. To ensure consistent flame-resistant protection throughout the entire Occunomix sweatshirt, the thread is constructed of flame-resistant, melt-resistant Nomex. Soft and comfortable to wear, this men's FR sweatshirt contains a 10 ounce, 100% ANSI/ISEA 107-2015 modacrylic/poly/cotton fleece blend. Modacrylic is a synthetic material that’s strong, resilient and is quick-drying. Combined with the cotton and polyester fleece for a soft feel, you have an ideal blend of fabrics. The handy, one-pocket pouch is big enough to store your essential items and to have them within easy reach. It also gives you a warm place to tuck away your cold hands while you're in this hi-vis FR sweatshirt. This Occunomix Men's Yellow High-Visibility Fire-Resistant Sweatshirt LUX SWT3FR is your winter workplace ally. It’ll keep you safe around heat and flames, warmly insulated when the temperature nose-dives and keeps you highly visible. Since Illinois weather can be brutal was looking for something warm to replace HiViz vest so this item was purchased. That's why was very disappointed that it was SO lightweight and so thin. I will say that it is comfortable and fit well; item fits pretty much true to size. So ok for fall weather but not recommended for winter. 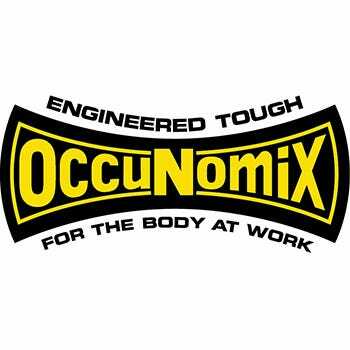 Occunomix Sweatshirts: Men's LUX SWT3FR Flame Resistant Hi Vis Sweatshirt is being added to your cart.